Place the nuts, onion, garlic and spices in a frying pan with 2 tablespoons of oil and over low heat gently cook the mixture until aromatic. Season with soy sauce, salt and more chilli if you want it even hotter. Add pork and simmer until meat is cooked. In another pan saute all the vegetables to your desired doneness, I only cooked mine for just a few minutes as I like my spring rolls crunchy. Add the pork mixture and cook for 2 minutes, stirring well to combine. 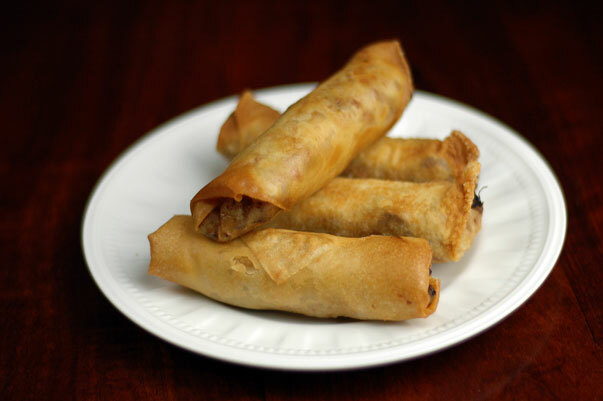 Separate the spring rolls. This can take some time as the little buggers stick together, so leave the mixture in the refrigerator until you've got them all separated. Make a paste of flour and water that you can brush on the ends of the wrappers. Place a spoonful of mixture in one corner of the wrapper and fold the end over the mixture and squeeze it together to tighten the roll and roll til you're in the middle of the wrapper. Fold both sides into the middle and put some paste on the top end. With the flat of your hand, push the roll to the end. Set in one layer on a plate. Let the rolls sit for an hour before frying or keep enough to fry and freeze the remainder. Heat oil to 180C/350F and place one roll in the middle and cook for 30 seconds and turn over and cook for another 30 seconds and move to the side of the pan and place another spring roll in the center of the pan and continue. As the previous rolls become golden brown, remove and place on absorbent paper. Serve with a mixture of plum sauce and soy sauce.